Welcome back to the Dynamic Discs Women’s Series, where we get to learn more about one of our female team players through a four-part blog series. So far we have gotten to know many of the women who have been touring the nation, but today we’re going to check in with an incredible player whose name you’re going to start seeing a lot more of! Originally from Cold Spring, New York, the desire to move to Colorado with her fiancé would change Missy Gannon’s life forever, but not in the ways that she thought. In Part 1 of this series, we’re going to learn how Missy got involved in disc golf and how she ended up loving the sport. Although her hometown is quite beautiful, Missy wanted to spread her wings and venture across the nation to make a new home for herself. 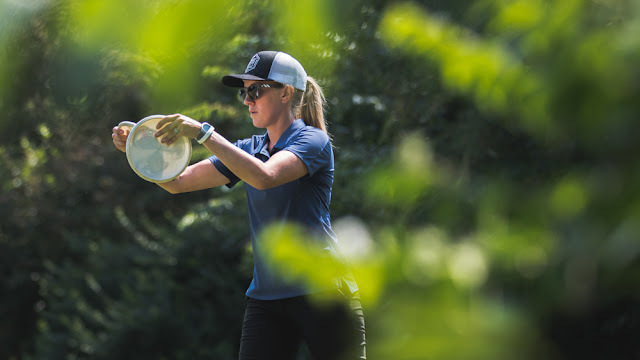 Growing up as an athlete, she had never heard of disc golf, and it wasn’t until she was almost finished with her two-month road trip to Colorado that she was handed a stack of discs. “I figured it was going to be easy and fun. I’d thrown frisbees before and thought it wasn’t going to be a big deal. I probably threw 40 or 50 feet before it hyzered out. I was pretty unimpressed with the sport right off the bat! I’m such a competitive person that when I wasn’t excelling it was hard,” Gannon shared. Unlike so many others who instantly fall in love with disc golf the first time they play, Missy’s friends didn’t get the reaction they were hoping for. Nevertheless, she pushed through to finish the 9-hole course they were on, and she even purchased a disc starter pack just in case she wanted to try again later. Missy and her fiancé traveled to Oregon before finally settling in Loveland, CO, and they decided once more to give disc golf a try. 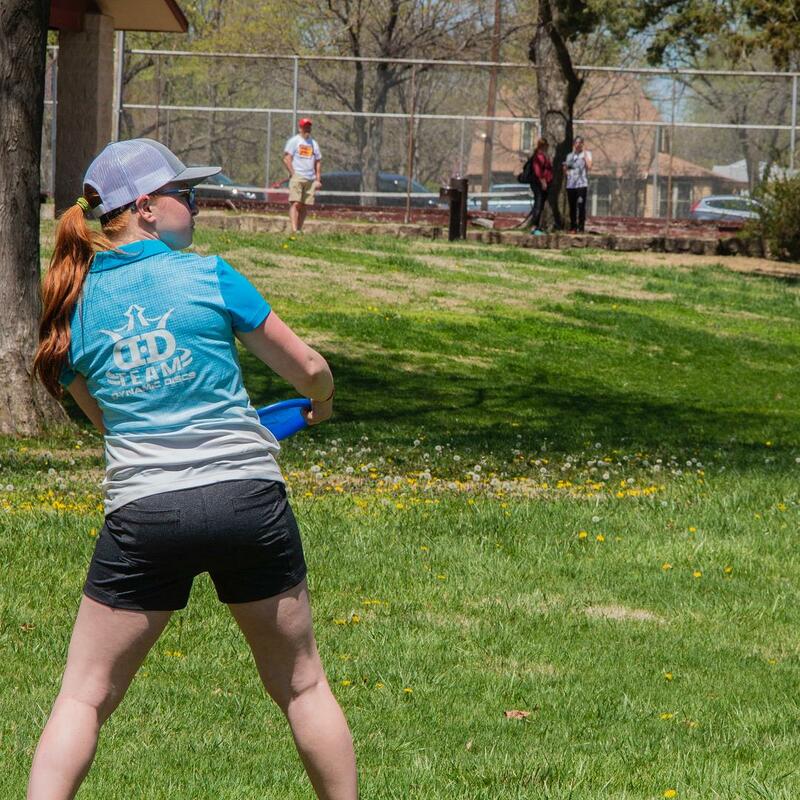 Even after this second go of it, she still felt like it wasn’t her thing, but with her competitive nature tugging at her, she couldn’t just give up without giving disc golf the attention that it deserved. “It ended up becoming something I was doing every weekend. Once we settled in Colorado we went from being avid hikers to playing disc golf more often, and we got involved with local clubs,” she said. It was this community support that really helped Missy to excel both in her skills and her attitude toward the game. Her first sanctioned event was in the spring of 2016, and she signed up for the Recreational division, not really knowing how her skills would compare against others. To her surprise, not only did she win her very first tournament, but she also would have won by a landslide if she played in the Advanced division! She began to play in tournaments every weekend and from then on was completely hooked. So how did she go from someone who didn’t really care for disc golf to a member of the DD team now touring the country? You’ll have to wait for the rest of our series to find out! Stay tuned for Part 2 where we learn more about the Colorado disc golf scene and how Missy went from a casual player to a well-known competitor. What Do You Do With Downtime? Recently we talked about how to plan for the upcoming tour season, and while 2019 sounds incredibly far away, the reality is that we only have a few short months to go before January is upon us. 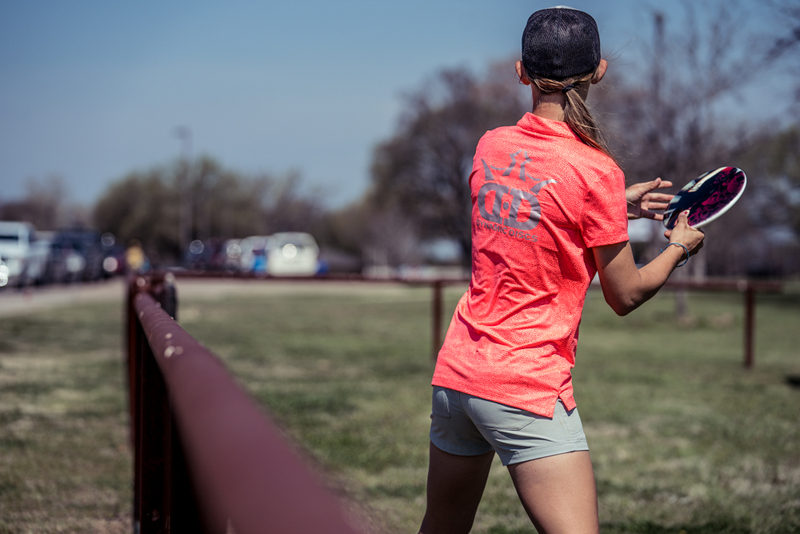 Whether you’re going to hit the road for your first tour or you’re a seasoned veteran who’s out to do it yet again, the reality is that you can’t be playing disc golf 24/7. 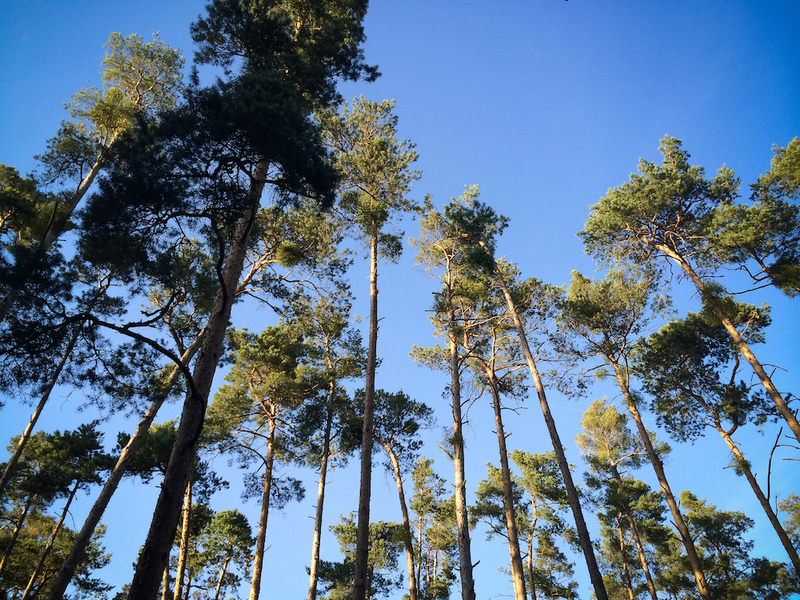 What exactly should you be doing with your downtime? And if you’re a local player who loves to compete but isn’t traveling far, how can you maximize those periods in the season when there’s not a lot going on? The answer sounds obvious, but practice isn’t always the first thing that people jump for joy about. Those of us who are naturally competitive typically gravitate toward the chance to win, so playing in tournaments comes in as a priority. Even casual rounds between friends can bring that sense of adrenaline that many love, but if no one is around to play, it doesn’t mean your season has to be put on pause. Whether you’re staying locally or you’re on tour and there’s a big break between events, head out to do some field work or smash out some putting practice at a local course. While it’s not as fun as playing a round, this effort toward bettering your game will certainly pay off during 2019. 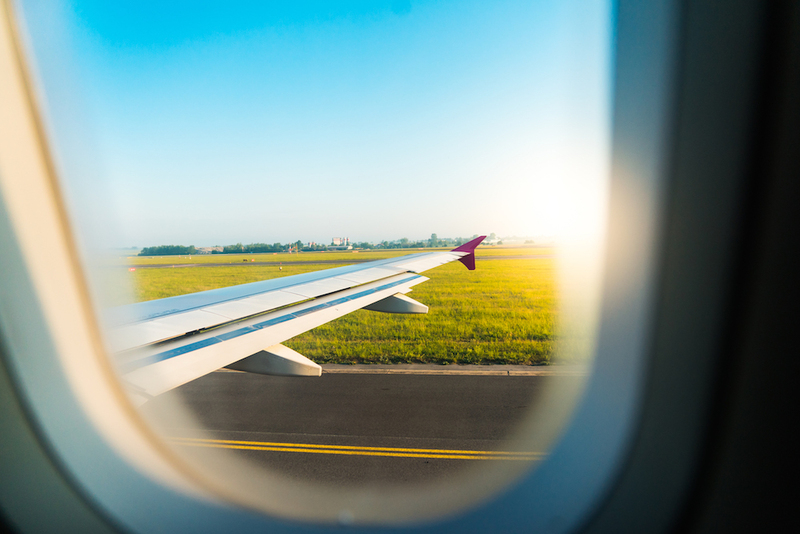 Touring pros surely don’t have as much time on their hands as local players, so if you’re planning on a full-fledged excursion during 2019, this may not be as applicable. 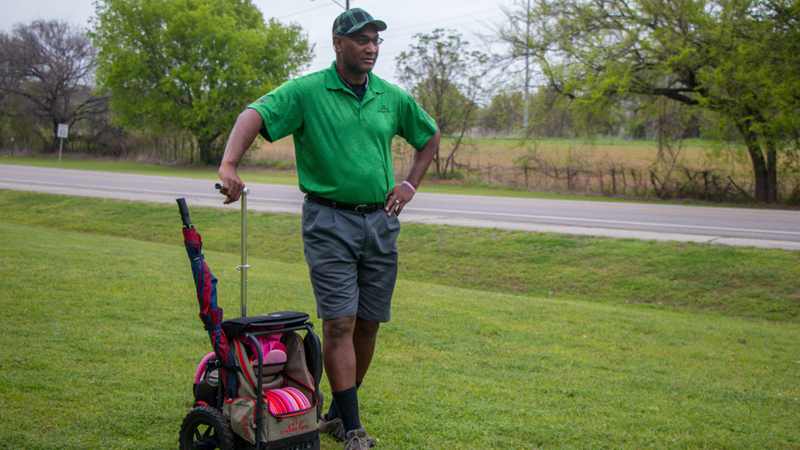 Yet for players who stay close to home and need something to fill their weekends with when there aren’t any local events, volunteering at your local course is a great way to go. 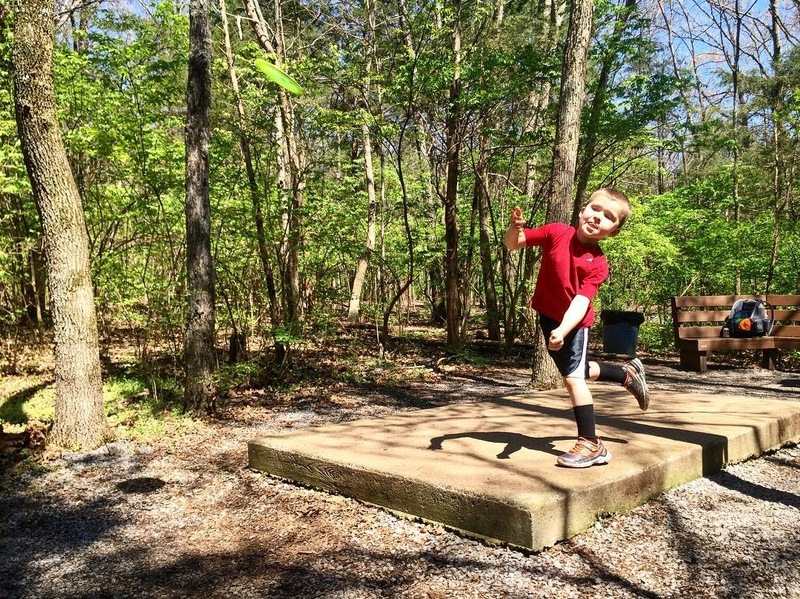 We all know this, but it’s easier said than done - disc golf is about so much more than just playing, and giving back to your community goes a long way. You don’t have to suddenly become the person who is planning every work party or fundraising like there’s no tomorrow, but instead of sitting on the couch during a lull in the season, get out there and lend a hand! Players at home and on the road can both benefit from a little spontaneous travel every now and again. If you’re on tour and have a week-long break and are too far from home to make it worthwhile, who can you visit that’s close by? What courses can you explore for the very first time? Likewise, local players can plan a small road trip to get out of their usual routine and play at courses that they’ve only dreamed about. You don’t have to go far, but a little imagination helps. When you think about the 2019 season, how do you see yourself utilizing your downtime? Share with us the tips and tricks you’ve used in the past and what you see yourself accomplishing in 2019. Have You Seen DGWeekly Live? It’s hard to believe that we’re already almost to double-digit episodes when it comes to our newest video series DGWeekly Live! Both Danny and Anthony spend some time with us reviewing a selected disc and they aren’t afraid to get into the details. You’ll see different plastics, a variety of stamps, and real talk about how each specific disc will fly based upon varying skill levels. Stay tuned for more episodes of DGWeekly Live and get your questions ready! Danny and Anthony give you the answers you’re looking for during the broadcast, and you just might win a disc for becoming involved! Do you have a request for a specific disc for us to feature? Let us know in the comments below! Wait, we’re only just in the midst of summertime and tour season hasn’t even finished - why are we talking about 2019 already? For some, the thought of planning for next year is so far from their minds, it almost gives them anxiety the moment you mention it. However, going on tour is an involved task, and you almost can’t plan too early. Whether you’re out on the road right now or not, it might benefit you to think about your tour plans for the next year. The earlier you can plan where you’ll stay and which events you’ll participate in, the less stress you’ll feel as the months go by. Those who are currently on tour during 2018 have a huge advantage when thinking about the 2019 season, as you not only have the experience on the road but you can look to past experiences to inform your future choices. Was there a particular event you played this year that was an absolute must visit from here on out? What about cities that left something to be desired and events you’d rather not have to endure again? No matter what the specifics are, take a peek at how things have gone this year and allow yourself to travel to events that feel right for you instead of simply following where the other players go. While some TDs are still trying to get through this year, others are already roughly mapping out when and where their 2019 event will take place. 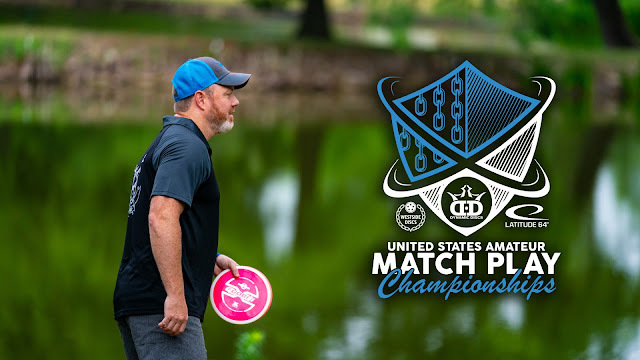 The PDGA website is always a great resource to look ahead to future events, and simply just getting these on your calendar is a good starting point. As the end of the year nears, these events will be solidified and you can make a more detailed plan and start to map out your stops. Once you have a good idea about where you’ll be and when, you’ll be ready to start talking accommodations. Sometimes it can be nerve-wracking to book a hotel or AirBnB six months in advance, but as long as you carefully review their cancellation policy, you should be in the clear if things change. Securing your lodging well in advance can help you to get lower prices and won’t leave you in a panic if it’s the week before a tournament and no rooms are available. Could you wait to do all of this planning until the winter months? Sure, but if you plan on training during the offseason or simply want to take a break from even thinking about disc golf for a while, it will pay off to get your plans secured way ahead of time. We want to hear from you! How far in advance do you schedule your season tour? Is it crazy to begin talking about 2019 when we still have so much disc golf left, or is it the smart thing to do and most people are missing the boat? Let us know your thoughts in the comments below. Let’s face it - right now it’s hot all across the US. 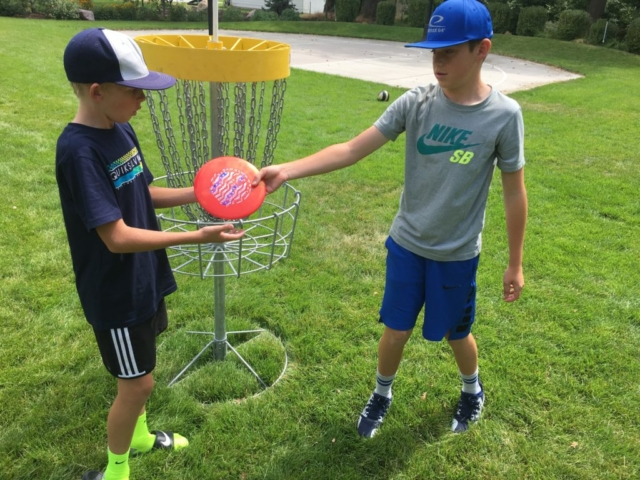 No matter where you live you are often faced with the decision between playing a round of disc golf and staying cool in your air conditioning. If you do decide to brave the heat, courses near you that feature major bodies of water are often the prime choice. It’s naturally cooler by the water, so whether your course plays around a lake or alongside of a river, you can beat the heat simply by choosing that location over another. While that’s great, it calls into question a challenge - how do you avoid losing your discs to the drink? Those of us who have big arms often like to air them out as much as possible, yet when you’re playing a course that requires a little more calculation, you may want to restrain yourself. Instead of playing the power shot and going for the green when you’re right next to the water, it might be smarter to play calculated golf shots. Try clubbing down and relying on your disc to do the work for you. Midranges and putters are often your best bets when playing somewhere that has a narrow fairway. When there’s a good chance that you’ll lose your disc to the water unless you throw your line perfectly, caution should be the name of the game. Some bodies of water are more forgiving, or at the very least more clean, allowing you to retrieve any errant shots before they are gone forever. Yet if you’re in a rush or are playing with a group who isn’t as patient, you don’t want to think about the fact that you could’ve gotten your favorite disc but didn’t. 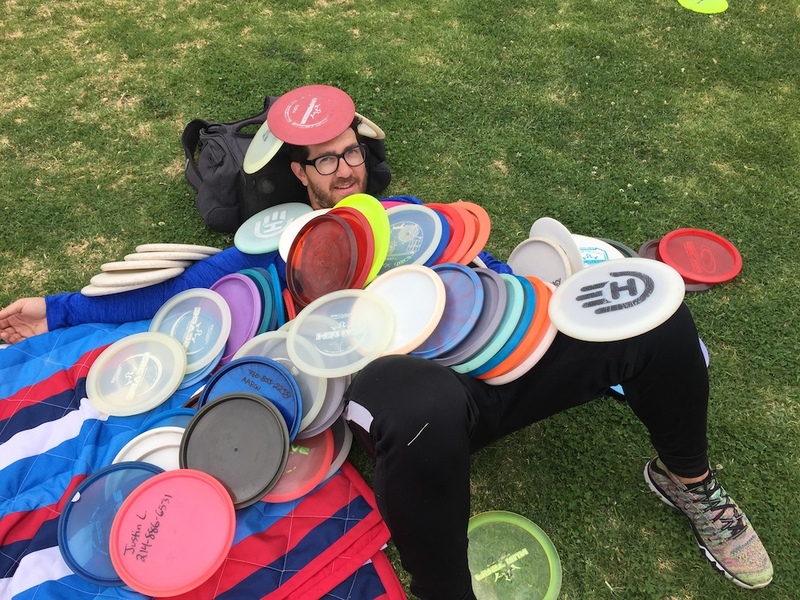 Instead of laying in bed awake at night mourning the loss of your plastic, go through your long lost stash of plastic before heading to the course. Now there’s no reason for you to throw discs that you absolutely hate, but if you have backups of your favorite molds that you don’t really throw, you might think about taking them out in case you end up with a few in the water. After all, you’d hate for your most recent ace disc to be the victim of grip lock. Rounds of golf close to the water can be deceiving, as it can be super hot during the day yet things can cool off dramatically once you’re at the course. If you’re dressed for 100-degree weather yet are shocked to find that a lake breeze brings down the temperature substantially, you don’t want to be caught unprepared. Bring a light jacket or sweatshirt just in case things cool down, preferably something that’s easy to take on and off if the wind is sporadic. Even if the latter part of the day is forecasted to be on the cooler side, make sure to bring plenty of water and of course a few snacks. How do you manage your play on a course that’s filled with treacherous water? Share your tips with us below! When you’re only a teen and yet you’re already sponsored by a major disc golf company and you have more wins under your belt than most adults, the sky’s the limit. At least that’s the case for Cynthia Ricciotti - we’ve focused this Women’s Series on the Missouri native who is so passionate about disc golf that it nearly puts the rest of us to shame. 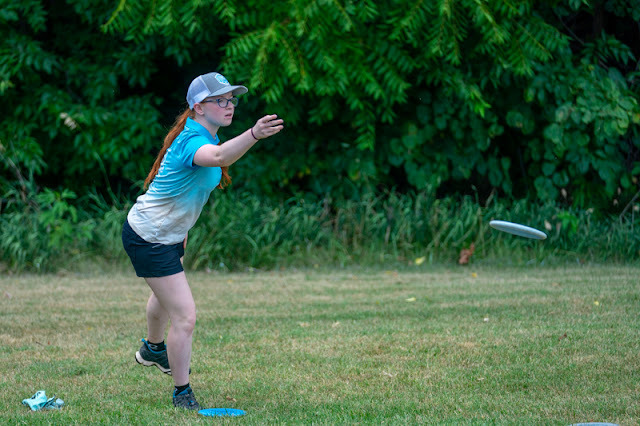 Cynthia is about to enter her sophomore year of high school, and we’ve learned about her practice routines, how she balances school and disc golf, and what got her into the sport to begin with. Now it’s time for the all-important question - what’s next? 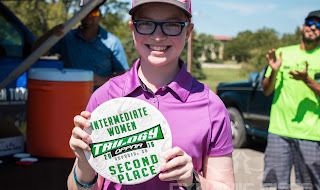 Before Cynthia can even think about college (after all she does have three more years in high school), the next logical step for her in her disc golf career is when to move up and compete in the women’s open division. While she’s had a huge amount of success so far, the leap to pro is a big one. That calculated level of thinking is exactly how she’s attained so much success already, as she takes the time to make sure her priorities are straight and she’s making good decisions along the way. Young disc golfers always have a crossroads in front of them once they are finished with high school. Do you start college and continue to play local events, traveling only when you can? Or do you forgo the traditional route and embark on tour like we’ve seen several other young players do? We are so pleased to have Cynthia as a part of the Dynamic Discs team. She is a true inspiration for younger players who aspire to grow their skills and her drive to accomplish everything she sets her mind to is something that even adults can look up to. Thank you Cynthia for sharing your story with us! 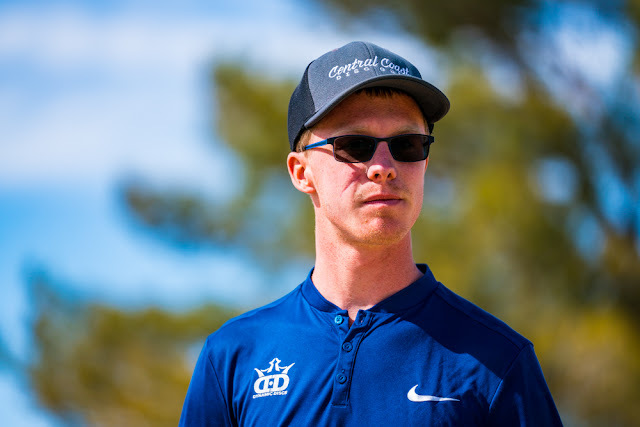 Jonathan Ray gets to live the life most disc golfers only dream of doing, traveling and working for disc golf. Jonathan has been traveling the country in his Dynamic Discs RV setting up his moving disc golf pro shop at big events. Although he does not get to play as often as he'd like, from time to time he makes sure to fit in some tournament play. This year the PDGA Masters Worlds was in Kansas City which gave Jonathan the opportunity to compete. At the time of this article, the competition had just started, but he had already garnered a world title, Long Drive Champion at 2018 Masters Worlds. We asked Jonathan a few questions about his winning throw at this year's field events. Dynamic Discs: How long have you been playing disc golf? 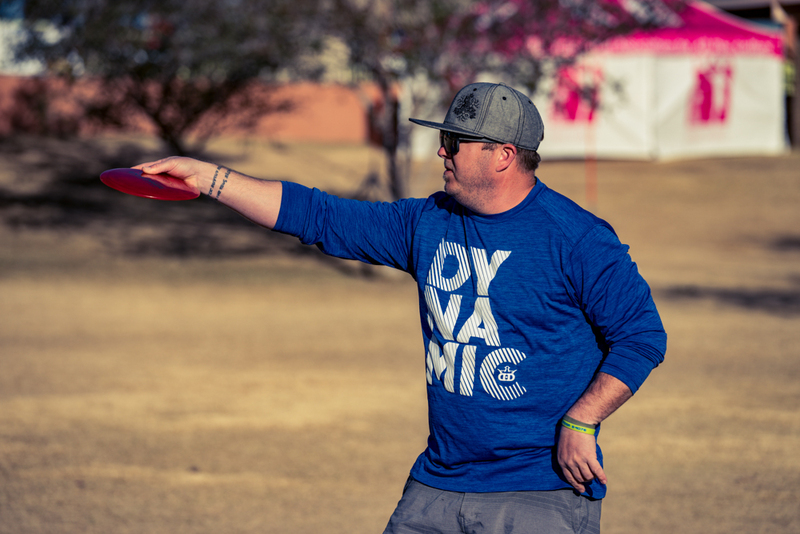 Jonathan: I started playing disc golf in 2010 recreationally and my competitive nature quickly pushed me into tournament play. I’ve been traveling the country in one of the DD RV’s competing and bringing the DD love to the lower 48 states for the last 4 years. Dynamic Discs: What disc did you throw and did you only throw one mold? Jonathan: I threw 2 Enforcers and 3 Ballista Pros in the competition. 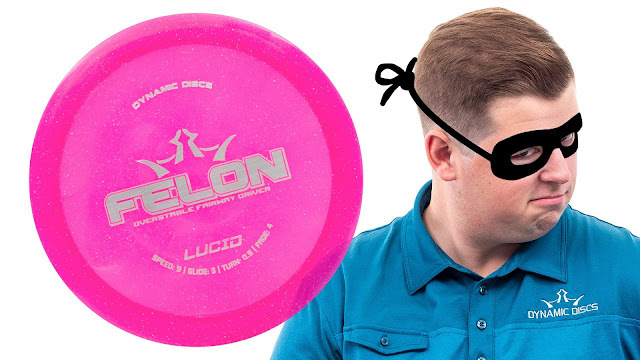 Dynamic Discs: Why did you pick that disc(s)? Jonathan: This competition requires not only distance but accuracy as well. I chose my enforcers for their stability at high speeds to make sure I got some qualifying throws in bounds before I went for the big shots. The Ballista Pro is what I typically use for raw distance but they can be a little more touchy when thrown hard but have unparalleled glide for a high-speed driver. Dynamic Discs: What were the wind conditions and did that cause you to make any adjustments to your normal throwing? Jonathan: I got to warm up a little to test the wind and it was an odd right to left crosswind. I wasn’t able to throw hyzer flips because the crosswind would push them down too quickly so I went with my more overstable discs and threw more straight line flex shots. Jonathan: My 3rd throw was the one that won it for me with my Ballista Pro at 501 feet. I had two safe throws in bounds at about 475 feet and then started pressing with the last three. I was trying to hit the 600 mark with my last two but the crosswind wasn’t letting them come out of the turn with that much spin on them. Dynamic Discs: Did you throw at the beginning of the day or toward the end, after throwing your furthest throw, how confident were you that it had a chance to win? Jonathan: I threw as soon as we were able at 11 am. I wanted to get out and get a practice round in at Waterworks that afternoon so it made sense to go early. I honestly didn’t think that distance would win. I had thrown much further warming up with a slight tailwind. The crosswind forced me to adjust and lower my expectations. I anticipated needing 550 feet to win and left feeling like that wouldn’t hold up. Dynamic Discs: What advice do you have for players that are running to achieve maximum distance? Jonathan: The best advice I can give players trying to gain distance is to focus on your core strength and legs. That’s where your power is coming from. Create torque from your lower body. Don’t try and throw harder, try and throw efficiently using your bigger muscle groups. Smooth is fast and fast is far! Congrats to Jonathan Ray on his world title! Paige Beat Ricky In Finland - Find Out How Here! Ok, we should clarify and set the stage a little bit to more fully explain the situation. During the last day of competition at the Tyyni, we headed to a school in Finland to do a disc golf clinic. It’s an incredible opportunity to not only get the chance to play in other countries but being able to have our pro players share their knowledge with kids is a true gift. The Prime Burst Gavel was the star of the show for a bit as we threw some lighter weight discs to see who could come closest to our “pin” - it was clear from the start who was actually out on the road playing for a living and who doesn’t spend enough time on the disc golf course. We tried throwing five putters into a basket at once to see how many we could land, and once again the pros got more love than some of the team members who gave it their best shot. Oh, and we can’t forget about the fact that Paige did, in fact, beat Ricky - at a CTP throw. More than anything else, this video will give you a good laugh and let you see some of the beautiful scenery that Finland has to offer. Take a work break and go watch it now! The team at Dynamic Discs is committed to growing the sport of disc golf in every way we can, and as the host of this year’s Junior World Championships, we took our mission of growing the sport even further. All competitors in the event received a free disc with the stamp “My First Golf Disc” on it. The challenge was simple: find a friend back home who has never played before and hand them this disc before taking them out to play. 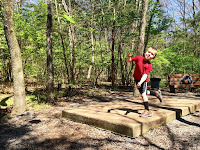 Even better, we encouraged kids to take a photo of this special moment and submit it to us at growdiscgolf.com. Not only are we super excited that kids across the nation will be receiving their very first discs, but we’ve decided to take it one step further and offer store credit for online purchases over the next 10 weeks. Bobby explains all of the details in this quick video. Do you remember your first disc? What was it and who gave it to you? Share your stories with us about how disc golf was introduced to you and how you’ve shared the sport with others. The DD Women's Series - Part 3: Cynthia Gets A Sponsorship! 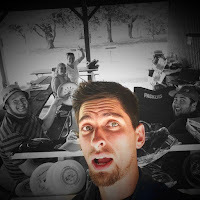 Getting sponsored to play disc golf is perhaps one of the top priorities of many players out there, and even if you aren’t actively searching for this type of support, at the very least you could say it would be a dream come true! Now imagine getting sponsored before you even got your driver’s license - for Cynthia Ricciotti, that’s exactly what happened. We’ve learned about her passion for the game and how she stays sharp on the course and excels in school during our first two parts of this DD Women’s Series, and now it’s time to learn how she became aligned with the DD Team. Cynthia played a lot of disc golf before even thinking about becoming a sponsored player, as the bug bit her and she fell for the sport hard and fast. As a lifelong athlete, she finally felt as if she had found the sport that she could grasp onto and actually have a shot at, unlike her previous love of gymnastics. With this renewed focus on disc golf, Ricciotti wanted to put it all on the line to become the best player she could be. She shared with us that she had actually been looking for a sponsorship for years prior to joining the DD family and that it was a long road to get where she is now. After the 2017 GBO, she was fortunate enough to play in the Champs Vs. Chumps and gained a lot of attention because of how far she could throw. Realizing that Dynamic Discs would be a great fit for her, she decided to go for it. “I sent in an application and actually got rejected. I wasn’t expecting much to come from it but I sent one anyway,” she said. However, with patience on her side, Cynthia once again got her chance. So what’s in store for Cynthia? She does have three years left in high school, but beyond that, the sky's the limit. Make sure to join us for Part 4 to learn more about her plans for the future.